Still have your ticket stub from seeing The Rolling Stones in Wembley Arena? Of from the 11-inning Game 7 between the Florida Marlins and the Cleveland Indians in the 1997 World Series? Or maybe from a concert, performance, game, museum opening or other event that isn’t historically significant but is especially important to you. 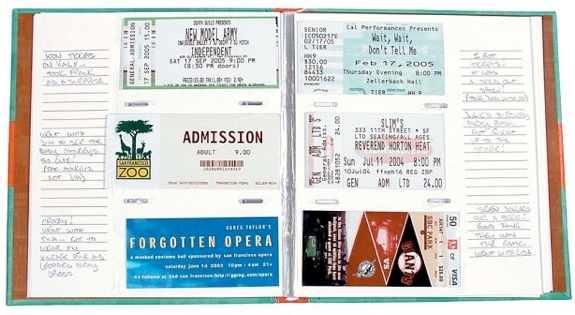 Tickets of all sorts can be preserved, organized and collected in The Ticket Stub Diary. This handy, little lightweight journal features clear plastic sleeves and acid-free paper for protecting your stubs. In the margins, a lined writing area is for jotting down notes — keep a list of special memories, scores or playlists, a count of how many beers you drank at each event, etc. Included with the book are adhesives for keeping your tickets in place inside their sleeves. We also like how the inside back cover has a pocket for storing other related items. The downside of this format, of course, is that it isn’t as versatile as a general scrapbooking album. 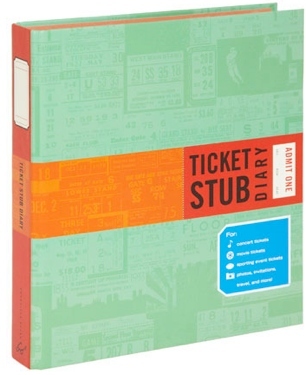 But for an easy-to-use memory-keeping diary, the The Ticket Stub Diary is just the ticket.  Ticket stubs, that is. “Protecting your stub” sounds like a really bad euphemism.